You know those times when you feel like cooking but are low on kitchen staples? Tonight was one of those times for me. Surprisingly, I’ve found that when I’m lowest on ingredients I usually have on hand, I tend to come up with the most creative and unique dishes. While steaming some kale and whole crimini mushrooms in balsamic marinade, I decided to do something fun with the mushrooms rather than enjoy them on their own. This evolved into using some edamame I had in the freezer to make a hummus-like edamame dip infused with hemp seeds, lemon juice and chickpea miso. Here is the result. It’s such an easy recipe, I can’t believe it took this long for me to discover it! I bet you could make this look classy and serve it at a fancy (pants) party! 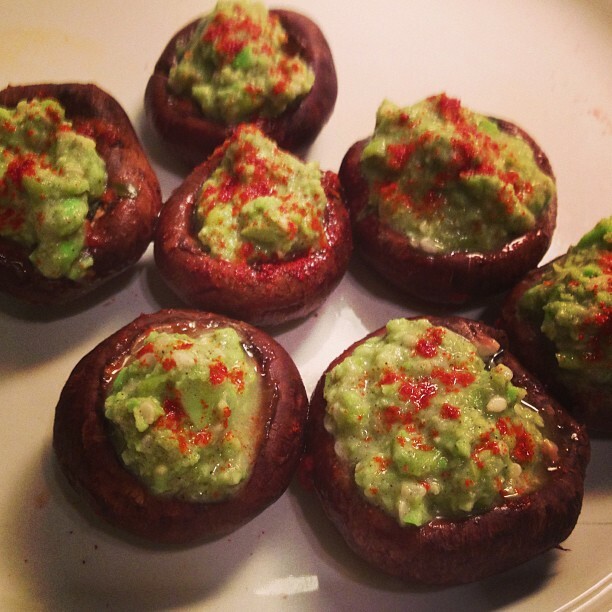 Cook the whole mushrooms in the balsamic marinade and water on the stovetop for 10-15 minutes. Meanwhile, blend or food process all edamame dip ingredients. De-stem the mushrooms after cooking (feel free to save them and use them in another recipe) and stuff with dip. Enjoy!